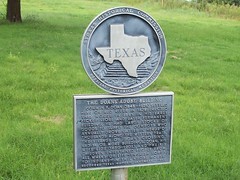 It was at this location, where the Texas Cattle Trail crossed the Red River, that C.F. Doan maintained an extensive mercantile operation. 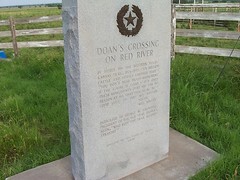 Though the store was on the Texas side of the river, the crossing became known as Doan's Crossing. It was last used in 1895, but during its existence over 19,000,000 head of cattle crossed here on their way to markets in Kansas. 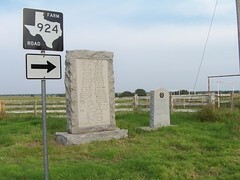 At this time we have not found the Oklahoma marker. We did however found it's match across the state line in Texas. Possible Location of marker found in the Chronicles of Oklahoma, Volume 38 (1960) Pages 211-212: In Jackson County, southeast of Hess (1 mile east 4 miles south and 1/4 mile east) on section line road, south side of Sec. 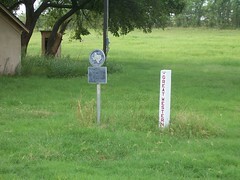 36, T. 1 S., R. 20 W. Because of flood plain on Red River, this marker was placed here on high ground about 3 1/2 miles north and west of the actual crossing on the river. Corwin F. Doan (1848-1929) settled here on Red River in 1878; erected this house in 1881. In his early picket store and later, permanent building, he had large stocks of good to supply the cowboys who annually drove cattle in heards of thousands along the Western Trail. The village of "Doan't Crossing" had 14 or more buildings. 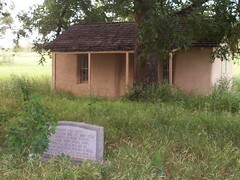 Doan, his wife Lide (1850-1905), and their 3 children entertained people from all walks of life - English loards to indians - in this adobe house. Recorded Texas Historic Landmark - 1962. 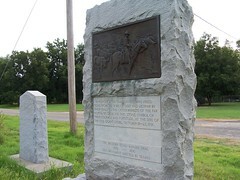 Great Western Trail Marker #1.